Can we identify children whose head injury is non-accidentally occurring using the presence or absence of certain clinical criteria? Exclusion: pre-existing brain malformation identified on CT, absence of acute head trauma, head trauma from RTC. Results: 209 patients recruited, of whom 45% (95) met one or more of the criteria for non-accidental head injury defined a priori. Of these patients, abuse was admitted by the perpetrator in 14 cases and moderately-strongly suspected (2+ extracranial injuries) in 53 cases. 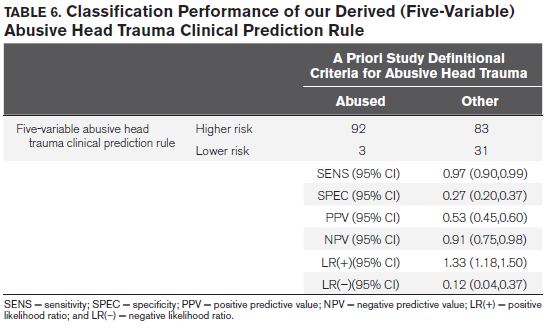 Once validated, the rule could be used by paediatric intensivists to calculate an evidence-based, patient-specific estimate of abuse probability that can inform – not dictate – early decisions to launch or forego an evaluation for abuse. The methodology here is quite complicated. Essentially, the authors have decided in advance some criteria which cause or allow a high probability of non-accidental trauma as the cause of head injury in their PICU population (let’s call these reference critera). They have then measured the presence or absence of historical, examination or radiological findings and, while measuring the reliability of their assessment of the presence or absence of the findings, have correlated the presence or absence of the finding with non-accidental trauma as defined by the reference criteria. The individual findings were divided into “early” or “late” to help determine those likely to be present at the time of PICU admission, and the most reliable and discriminating criteria identified. These were then combined into a decision rule which was applied to the population again, and test characteristics calculated. Phew! There are a few problems here, most of which the authors identify. The major issue is true of all non-accidental injuries; there is no certainty in the diagnosis, no gold standard, and as anyone working in child protection knows identifying children who have been intentionally or neglectfully injured is a game of probability in the absence of confession (and even then not always a certainty). Vigilance is key; overdiagnosis causes a massive workload for paediatricians and enormous stress for families and patients (who are often separated during investigations), underdiagnosis fails the child and the family, often with tragic, deadly consequences. The criteria used as a reference standard (table 2) are a reasonable surrogate for a gold standard. The other problem we have is that this is a very select population; by definition, these are the more severely injured children and it is likely that a significant proportion of non-accidentally head injured children will not require PICU. This immediately affects the extent to which we can generalise the findings to our significantly different PED population. Figure 2 shows the decision tree the authors developed from the most reliable and discriminating variables. 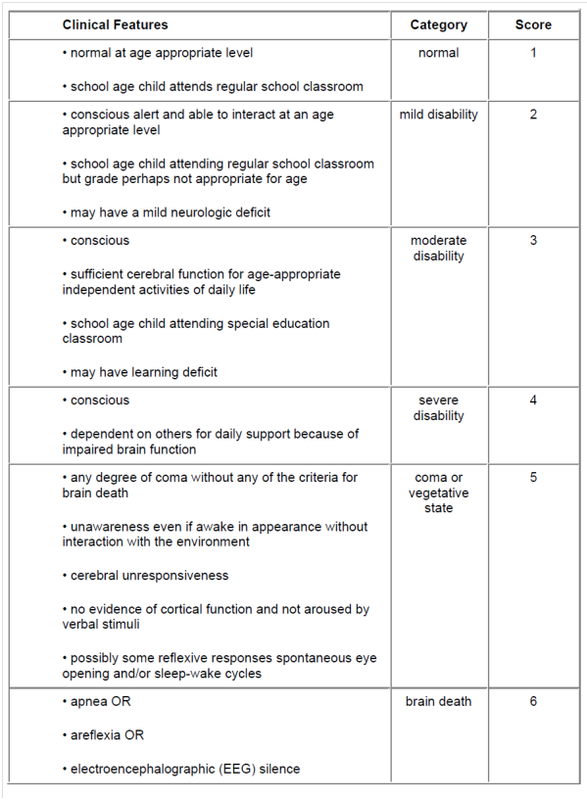 The authors have then calculated the test characteristics for the decision tree as shown in table 6. As we can see by looking at the decision tree, the tool is far more sensitive than specific, thereby acting as a better tool to rule out NAI than ruling it in. In fact, the sensitivity is perhaps not as good as we would like (look at the 95% confidence interval – it could be as low as 90%). We can see that 3 patients classified a priori as high risk were misclassified by this tool as low risk. The negative likelihood ratio is small, suggesting that a negative result in this population (with a low pre-test probability) produces a very low post-test probability, but again the confidence interval is quite wide. The authors concede that adding any further variables would make the rule too complicated to be practical, which seems reasonable, but it does leave us wondering whether this rule will be fit for purpose with a potentially low NPV and sensitivity. 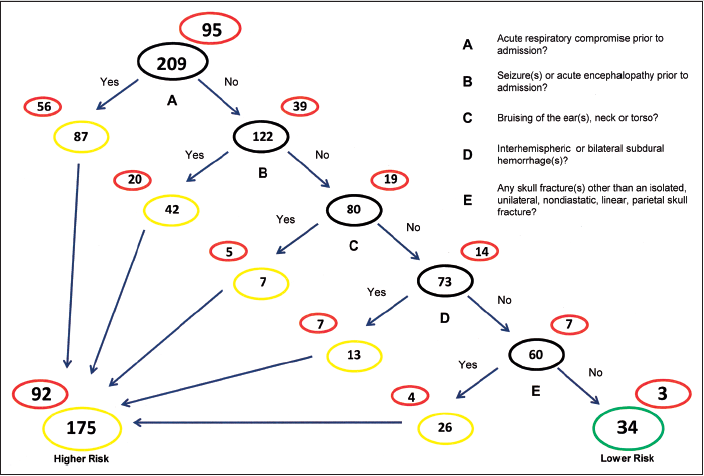 While this decision tree might, once validated, help to rule-out non-accidental head injury in the PICU population, the patients here are just too different from the PED population for this to be useful. In addition, our job in PED is to resuscitate these children and while it is essential that NAI is always on the mind of the PED doctor, for these patients stabilisation and management of the acute injuries must take priority. Does this rule add anything to our PED assessment? I don’t think so – these are not the patients in whom I want to think carefully about NAI as my priorities are different; they have immediate clinical needs and NAI can be considered in more depth later. The patients in whom I want to rule NAI out are altogether less unwell. 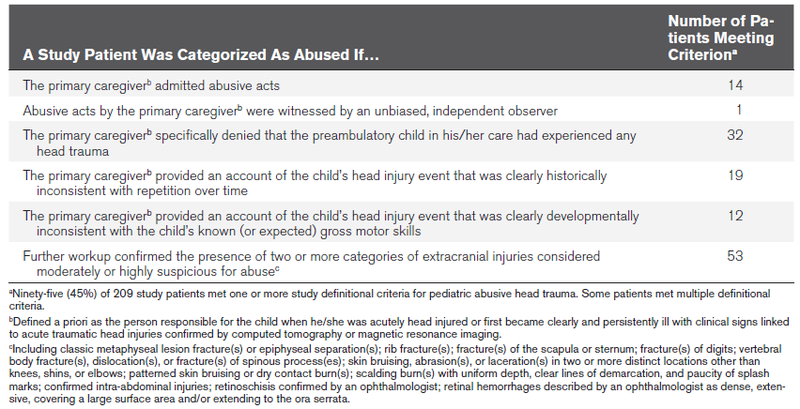 Any one of these five findings necessitates further PED assessment of the child from a perspective other than NAI. It’s not a bad paper – it just doesn’t help us in PED. How does this rule perform in other PICUs (validation)? How sure do we want to be of ruling out NAI (what sensitivity level should we accept in a tool like this)? Does it have any predictive value for patients in the PED? Are there other cues which do have useful rule-in or rule-out potential in the less seriously injured head injury patients in PED? This entry was posted in Critical Appraisal on January 25, 2013 by PEMLit. Happy New Year from PEMLit! Which method of temperature measurement – axillary, tympanic or temporal artery thermometry – is the best predictor of rectal temperature in febrile and afebrile children? Tests of Interest: Axillary digital thermometer – 5 minutes. Tympanic infrared thermometry as per manufacturer’s instructions (right and left ears). Temporal artery thermometry as per manufacturer’s instructions. Reference Standard: rectal thermometry – mercury thermometer for 3 minutes. Primary outcome: test characteristics and correlation coefficients for each method. Population: Children aged 2-12 years presenting to the Emergency Room of a single centre in Delhi, India. Exclusion: Abnormal ear or rectal anatomy, thermoregulatory disturbances, family history of malignant hyperthermia, diaphoresis, Hb <8g/dL, severe malnutrition/severe wasting (WHO classification), uncooperative, crying, unconscious. Results: 100 patients were enrolled, 50 “febrile” (Rectal T>38) and 50 “afebrile”. Temporal artery thermometry had the highest correlation coefficient for both febrile (0.99) and afebrile (0.91) children. Axillary thermometry had sensitivity 80% and specificity 100% (no confidence intervals given). Tympanic thermometry had sensitivity 98% and specificity 98% (no confidence intervals given). Temporal artery thermometry had sensitivity 80% and specificity 98% (no confidence intervals given). Temporal artery thermometry has the potential to replace rectal thermometry in the busy Emergency Room setting among children aged 2-12 years. Papers like this make me so sad! This could be such a great study – I’ve been asking the question “how should we measure temperature and what do we mean by fever?” for such a long time, and this simple study design has great potential to answer the question. Rectal thermometry is upheld as the “gold standard” in determining temperature but is not without risk. Unfortunately, there are a few gaps. We don’t know how the patients were selected, so there could be all sort of bias and confounders we don’t know about. And what about excluding children who were crying? OK, it might make them a bit warmer – but who’s been in a Paediatric ED which isn’t filled with crying children?! That said, they have a good size sample (100 subjects) and seem to have powered the study appropriately. But another question that arises is about the reliability of the measurements, in particular their standard rectal (mercury) thermometry. Who was reading these temperatures? How do we know their assessment is reliable – where is the kappa score? In terms of correlation with rectal temperature, termporal artery thermometry came closest, with temperatures in 50/50 febrile and 49/50 afebrile children reading within +/- 0.4 degrees of their rectal temperature. Axillary temperature seemed to correlate better in both groups than tympanic temperature. Tympanic thermometry had the highest sensitivity for detecting fever (98%), making it the best at ruling fever out, while axillary thermometry was the most specific (100%). No confidence intervals were given. 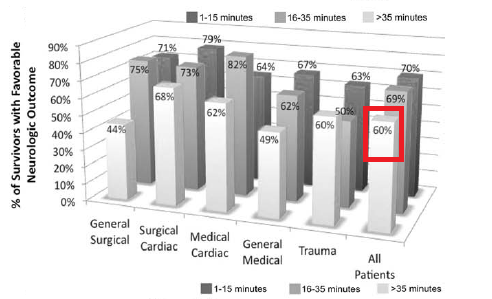 Are these figures useful in clinical practice? No, probably not. Despite the suspicious methodology, it certainly seems as though infrared temporal artery thermometry is the closest proxy for rectal thermometry, and with 99% of measurements within +/-0.4 degrees it seems reasonable to suggest it as the preferred method of ED thermometry in those aged 2-12 years. As a gold standard, how reliable is rectal thermometry? What is the best method for children under 2 years of age, for whom tympanic thermometry is not considered to be an option? This entry was posted in Critical Appraisal on January 4, 2013 by PEMLit.